1. Kidcreate Studio continues to open new locations in the United States and in 2018, the brand opened two new locations in Mansfield, Texas and Savage, Minnesota. The Mansfield studio opened in February, while the Savage location opened in May. 2. Kidcreate Studio in Mansfield is owned and operated by Vanessa Cancel, who felt it was time to make her dream of having a work/life balance a reality. 3. The Kidcreate Studio in Savage is owned by Carrie Berger, who spent 20 years in business administration working for large Fortune 500 companies. Berger had always wanted to be a business owner and searched for a franchise that would allow her time with her family and be a benefit to the community. Berger felt that Kidcreate Studio fulfilled everything she was looking for in a franchise. 4. Kidcreate Studio acknowledges that understanding and implementing various forms of technology can be daunting for business owners, who must first determine the technology best suited for their needs, then learn how to utilize it and weave it into the current business model. 5. To make things easier for its franchisees, Kidcreate Studio has already done all of the hard work. With a seamless integration of multiple technology-based systems in place, from initial training to ongoing support, franchisees are given all the tools necessary to succeed, including class-tracking software, database management, and online registration tools. 6. Kidcreate Studio’s class-tracking software was custom designed to allow franchisees to record where classes have been offered, track class performance, and organize curriculum information. Franchisees can easily remain aware of top-performing classes, capitalizing on the information to maximize profitability and keep a finger on the pulse of the business. 7. Kidcreate Studio provides customized database management software with a variety of web forms to help build and grow a database which also generates sales leads. In addition, the software serves as an all-in-one sales and marketing program, hosting more than 20 customized marketing campaigns, sending weekly newsletters, automating customer surveys, and assisting in employee task allocation. 8. Additionally, Kidcreate Studio has made registering online for classes easier for both franchisees and parents. The Kidcreate Studio registration system is fully integrated, automatically transferring customer information where it needs to be. From start to finish, the online registration process includes payment processing, a confirmation email, addition of the student’s name to the class roster, and the customer’s data imported into the franchisee’s Kidcreate Studio database. 9. Online registration is not limited to classes, however. Birthday parties become simple to plan with an easy party confirmation process, online party waivers, and upsell techniques built right into the party booking process. Online birthday party registrations also allow for customized art projects and gift bags centered around party themes. 10. Kidcreate Studio offers three different program options that are valuable for customers and for franchisees’ revenue streams: registration-based classes, group activities, and community events. 11. Registration-based classes are a type of class or camp that is offered with the hopes that families enroll their children. It is not guaranteed to run but the majority of them typically do. There are minimum enrollment numbers predetermined. The minimum number of children enrolled must be met in order to enable the class or camp to run. Registration-based classes are offered at the studio, through community education and parks and recreation programs along with daycares, preschools, and montessoris. 12. Group activities are booked by a program or organization with the idea that all the children will be participating in the activity. Group activities are offered through care programs, scout troops, daycares, preschools, montessoris, church groups, and “moms” groups. Different terminologies are used when referring to this type of class, including outreach programs, in-center activities, and field trips. According to Kidcreate Studio, these types of class bookings tend to be for a very large number of kids and can be very profitable for franchisees. 13. At Kidcreate Studio’s third option, community events, stations are set up where the kids at the event can create a predetermined art activity. Any of the children at the event can participate if they choose. 14. 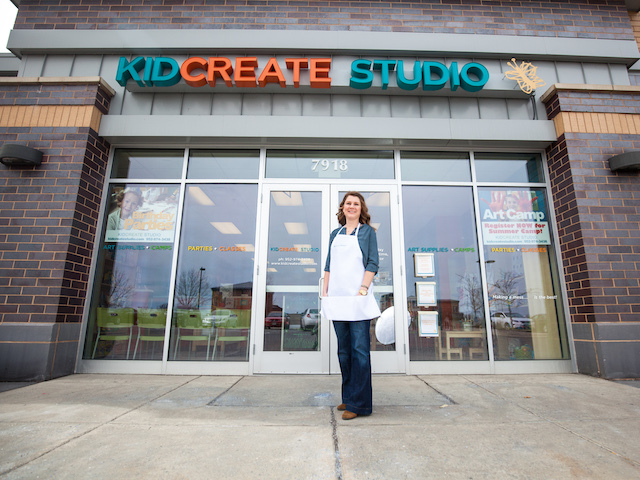 Kidcreate Studio was started in 2007 by Lara Olson in Eden Prairie, Minnesota. Olson felt that her son wasn’t being exposed to enough art in school and she wanted to supplement his art education. After being unable to find adequate art programs in her hometown, Olson decided to create her own kids art studio that combined quality art education with a fun, kid-friendly environment. 15. The following year, Olson opened the first Kidcreate Studio in Eden Prairie and that same year she launched the On-the-Go Studio division, which allows franchisees to bring the Kidcreate Studio curriculum to private schools, community centers, preschools, and other areas in their communities. 16. Kidcreate Studio’s growth has been slow and steady. The second location did not open until 2013 in Woodbury, Minnesota. Olson started franchising the Kidcreate Studio concept in 2016 and the company now has locations outside of Minnesota – in North Carolina and Texas. Kidcreate Studio continues to seek franchisees throughout the United States. 17. Kidcreate Studio did not rank on Entrepreneur’s 2019 Franchise 500 list. Please click here for detailed estimates of Kidcreate Studio franchise costs, based on Item 7 of the company’s 2018 FDD. Please click here for detailed information on Kidcreate Studio’s initial franchise fee, royalty fee, marketing fee, and other fees, based on Items 5 and 6 of the company’s 2018 FDD. As of December 31, 2017, the franchisor had two affiliate-owned Kidcreate Studio locations (“Affiliate Locations”) and one franchised Kidcreate Studio location (“Franchise Location”). The Affiliate Locations are located in Eden Prairie, Minnesota and Woodbury, Minnesota, and have been in operation since 2008 and 2013, respectively. The Franchise Location is located in Fayetteville, North Carolina and has been in operation since December 16, 2017. The financial information provided in the following charts represents the actual performance of the Affiliate Locations and Franchise Location for the dates listed below. The numbers have not been audited but the franchisor has no reason to doubt their accuracy. Franchised Kidcreate Studio Businesses will share some of the same characteristics as the Affiliate Locations, including degree of competition, and products and services offered, except that Affiliate Locations do not pay Royalty Fees, make Brand Fund Contributions, or pay the Technology Fee, and are not required to meet the Local Advertising Requirement. These Affiliate Locations also have reasonably similar operations as the Kidcreate Studio Businesses offered in the Franchise Disclosure Document. The franchisor has included certain expenses for the Affiliate Locations but not all of the expenses that they incur. Franchised Kidcreate Studio Businesses may or may not have similar expenses and they may have additional expenses than the ones listed below.